Mix cocoa, cornstarch, beaten egg yolks; sugar and salt, then add milk gradually, while stirring in a pot over med-high heat on your stovetop. Cook until thick, beating it smooth. Cream pies take some time to thicken, so stir, and stir (10-15 min). Using a heavy bottom pan really helps. Just keep it up until it thickens add vanilla in after you take off the heat. 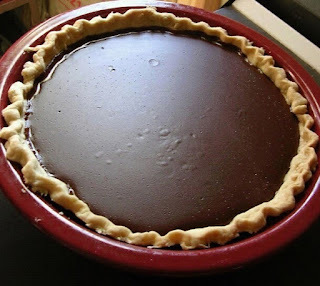 Pour into a pre-baked pie shell. Put in the fridge to chill, add whipped cream if you like :0 Or use the left over egg whites for a meringue topping!